The “Siberian Rocky,” Ruslan Provodnikov, realizes his own American dream. 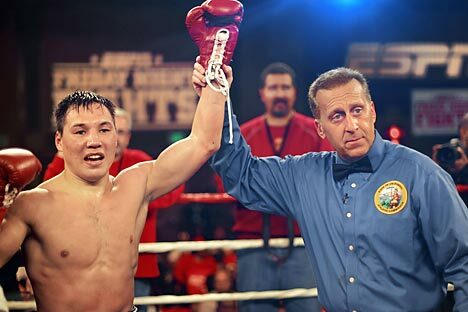 Ruslan Provodnikov has become the newest Russian world champion in boxing. Provodnikov captured the junior welterweight title of the World Boxing Organization (WBO) from American Mike Alvarado in picture-perfect style, forcing the referee to stop the fight in Denver after the 10th round. During the course of the fight, Provodnikov knocked down his opponent twice. Provodnikov’s victory was welcomed by both Russian and American fans; the latter noticed this boxer long ago and even dubbed him the "Siberian Rocky." The welterweight is popular with Americans for his hard-hitting style that leaves no room for compromise or doubt—the “killer instinct, as it is called in American sports. He is also remembered for his fight in March against the famous Timothy Bradley, in which the talented American defended his championship title but narrowly avoided a knockout. After this victory, fans will love him even more. Americans responded to the fact that, after Provodnikov's win, he immediately compared his victory to the famous confrontation of two American legends—Sugar Ray Leonard and Roberto Duran—and recalled how Leonard forced his staunch opponent to surrender in the end. Finally, in a very American way, Provodnikov reflected on his achievement, saying, "If you want to become world champion, you have to risk it all." Ruslan Provodnikov did take quite a risk. This story is really about how a burning desire to reach his dreams helped him overcome circumstances that were not on his side. Provodnikov agreed to fight Mike Alvarado, an extremely strong fighter, on American soil and in Alvarado's hometown of Denver, where he is a local hero. The timing of the fight was very inconvenient for the Russian, as well. Provodnikov works with Freddie Roach, one of the best trainers in the world of professional boxing. However, for this fight, Roach could not help him. Roach remained in the Philippines, busy preparing his star—the great Manny Pacquiao—for a fight against Brandon Rios. Despite this, Provodnikov entered the ring and achieved success using the style for which he is known. Promoter Bob Arum had promised that the Denver battle between these two well-known and fearless boxers would vie for the title of "Battle of the Year." This, of course, is unlikely. Still, at least Provodnikov and Alvarado delivered a show that was no less riveting than their usual matches. There was a fight and blood was shed. Much spirit and character were displayed. Mike Alvarado admitted that, in the second and third rounds, he had a feeling he had found the key to his opponent and thought he knew how to beat him. But Provodnikov laid into him in the fourth round, landing a sharp left uppercut and a half-dozen more dangerous punches, showing that his swelled right eye would not prevent him from hitting the target; Provodnikov has always been able to tolerate direct hits. The fight came to an end slowly, gradually becoming more intense; the damage suffered by the faces of the two opponents stood out more and more clearly. Steadily, Provodnikov's superiority began to be visible, as he seemed a bit more fresh and persistent. In the eighth round, Alvarado finally was unable to get out from under the regular blows and could not stay on his feet. He had to kneel and listen as referee Tony Weeks counted the knockdown. This happened a second time, after Provodnikov came out with a mighty blow to the body and a punishing right counter. Mike Alvarado showed he is a true warrior, recovering and even rekindling his energy at the end of the round. He later recounted how he has gotten out of these situations in the past, knowing how to endure painful blows. But Provodnikov, unlike all of Alvarado's previous opponents (among which there had been some good punchers), beat him so hard that the champion had just one recovery. In the 10th round, Provodnikov's advantage over battered Alvarado was already overwhelming. He landed punches on the American everywhere, including on the body and the head. For Alvarado's adoring fans, it could not have been fun to watch this. The only plus was that the bullying did not last long. At the end of the round, Weeks approached Alvarado, as is done in such cases, and clearly asked the boxer several times whether he could continue: Each time, the boxer no less clearly said, "No." Weeks then stopped the fight, which the judges scored 98:90, 97:90 and 96:92. No one doubts that team Provodnikov will not be lacking valuable offers. Although, when asked about his plans, Provodnikov openly admitted, "I want to relax." After such a tumultuous season, some rest really does seem to be in order.